Cutaneous ureterostomy is a well-established surgical technique of incontinent urinary diversion treatment. However, stoma stenosis limits widespread utilization of this technique. We present our modification of constructing single-site tubeless cutaneous ureterostomy aiming to reduce stomal complications and improve catheter-free rate of those patients. 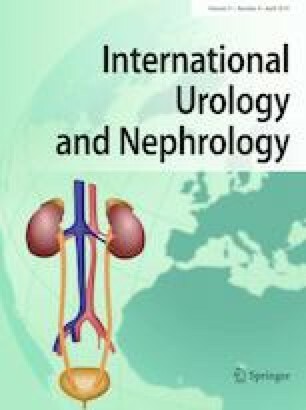 In 2016–2017, 30 patients with 60 renal units underwent modified and 30 patients with 60 renal units standard technique. The main differences of our method from previously described techniques were the preservation of parietal peritoneum and fixation of ureteral orifices one to another. Catheter-free rate was calculated in all patients with a minimum follow-up period of 12 months. In total, 52 patients, 26 from the modified cutaneous ureterostomy group, and 26 from the standard cutaneous ureterostomy group were available for the final analysis. The patients’ mean age was 63.1 years. The median follow-up period was 25.8 months (ranging from 1–37 months). The catheter-free rate was achieved 76.9% (20 patients) in the modified group compared to 42.3% (11 patients) in the standard group (P value = 0.013). No statistically significant differences were observed between two groups for late complications and readmission rates. Our technique of single-site-modified cutaneous ureterostomy is a safe and simple surgical technique with similar postoperative complications rate and better catheter-free rate compared to standard cutaneous ureterostomy. We believe that this technique could be a method of choice not only for candidates for cutaneous ureterostomy but also for selected patients for ileal conduit. All procedures performed in this study were in accordance with the ethical standards of the institutional research committee and with the 1964 Helsinki.